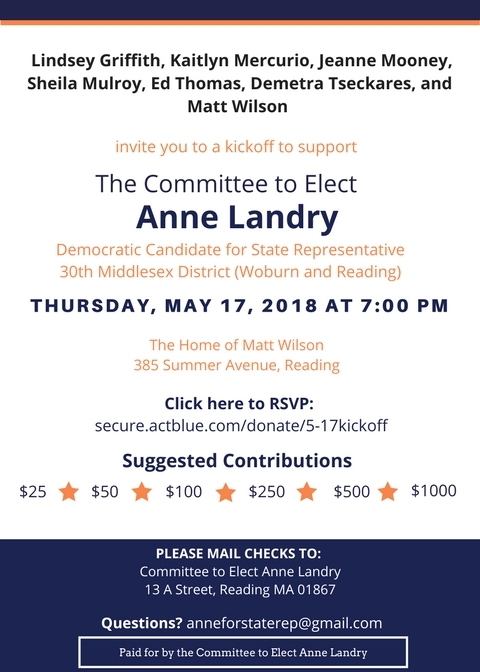 Reading, MA — The Committee to Elect Anne Landry announced Anne’s campaign kickoff event for Thursday, May 17th at 7:00 pm. Anne Johnson Landry is a Democratic candidate for State Representative of the 30th Middlesex District. The event will be held at the home of Matt Wilson at 385 Summer Avenue, Reading, MA 01867. The kickoff will be hosted by Lindsey Griffith, Kaitlyn Mercurio, Jeanne Mooney, Sheila Mulroy, Ed Thomas, Demetra Tseckares, and Matt Wilson.